Saw that Midnite will be playing in Santa Cruz July 20th, San Francisco the 22nd and Grass Valley, CA the 23rd, they are open on the 21st and 24th! Hoping they add two more shows in Nor Cal! I will be making the drive from Oregon for those shows, no doubt! Maybe they will even get booked in Oregon after NWWRF, I was beginning to lose hope they wouldn't make it out NW this year but things are looking good! "Time is not counted from daylight but from MIDNITE!" Re: Midnite booked for CA! Nice! Ill hope for a show in Marin after sf, 19 broadway or sweet waters, but time will tell. If not, I'm in for the independent show, Rossta we'll have to link up! Yeah teachdem, that would be awesome! Maybe they will add a marin show on the 21st! Would love to catch up with you in july! Wondering what show they will add on the 24th? rossta, have you gotten a ticket for the haven underground? i can't seem to find anything online. I'm sure that if you give Sista Kat a call (oneness-sound.com), she'll either be able to tell you where to buy one in advance or hold onto one until you reach. I have not bought any tickets yet, I was figuring I could get them at the door but maybe I should buy them in advance. I have heard that the 18th they will be in Denver, CO but nothing booked for the 21st yet. Hopefully another show will get booked in Nor Cal for that night. The Grass Valley show is the one I am looking forward to the most! Got Fairfax, San Fran and Santa Cruz bought! Ran into the same problem you did NOMO, only time I have caught one of Kats Midnite shows, which was the last one she put on in Nevada City, CA, she did exactly what Daniel said, I gave her a call and she held a ticket for me at the door! It was an amazing show! i got my Fairfax and San Francisco tickets, gotta make a call about the haven underground. No Santa Cruz for you NOMO? Nah, i'm going to skip that one. I don't blame you, almost did myself but figured if I am driving from OR, might as well catch all the shows. I am still waiting to see what show they add on the 21st! will be at Fairfax, Moes Alley and SF myself. might even try grass valley - love that midnite! STOKED! so blessed to see midnite again! will be in SF with friend who is a new fan...love spreading their conscious vibe. It's sista kat.... Yes!! Midnite is booked for July 23 in grass Valley... But we've had a venue change we switch the venue from the Haven underground to the minersfoundry cultural center in Nevada city... Originally I chose the haven underground because I wasn't sure if we be able to pack the minersfoundry because it's a summer show.. But because the Haven now is a bar they have knocked their capacity down to 200 people including guest list... So when crunching the numbers I realize I have to charge so much for ticket and now that it's a bar no families or children would be able to come... So I switch the event to the minersfoundry which is one of midnites favorite venues and I feel like we will rock the house!! So please come and support!!! And FYI, this is a hot summer night in Nevada city.. Which is a huge street fair so parking will be a little difficult so trying get there early! Also there will be tons of people everywhere..
And as always we have a curfew at the minersfoundry we will try to push it but I will try and have the band on by nine 930 so we can have a long beautiful set on Selassie I earthstrong!!! There'll be food vending and IRIE vibes!! And EVeryone of all ages are welcome !!! This is the first show I've done in a while and I'm truly looking forward to it!!! I'm still working out if there'll be an opener but JAh MIkey One will be nicing up the vibes for sure and setting the pace!! Bless up family... I hope to see u all there!! Thanks Sista kat, I know several of us will be there. Just a suggestion, last time I saw Midnite at the Foundry, the band came out for sound check, switched off instruments and played a sound check that those of us there loved! I would love to see them for 45 minutes open the show! Not sure if it's possible, but thought i'd suggest it cause i'd love to see it! Midnight is such a band of spontaneity you never know what they're going to gift to you with!!! I am very happy I switched the venue it seems like a more all-inclusive event!!! Super excited Sista Kat! I will call you as I am traveling from Oregon for this show and would like to purchase a tix in advance. You set me up with a ticket at the door the last time they played in Nevada City and the show was amazing! So excited, thank you for booking them! Yeah just give me a shout I will hold tickets for anyone traveling from afar and I know not everyone does the online thing!!! Edited 1 time(s). Last edit at 10/10/2015 09:05PM by Rooticalmama. Just announced! 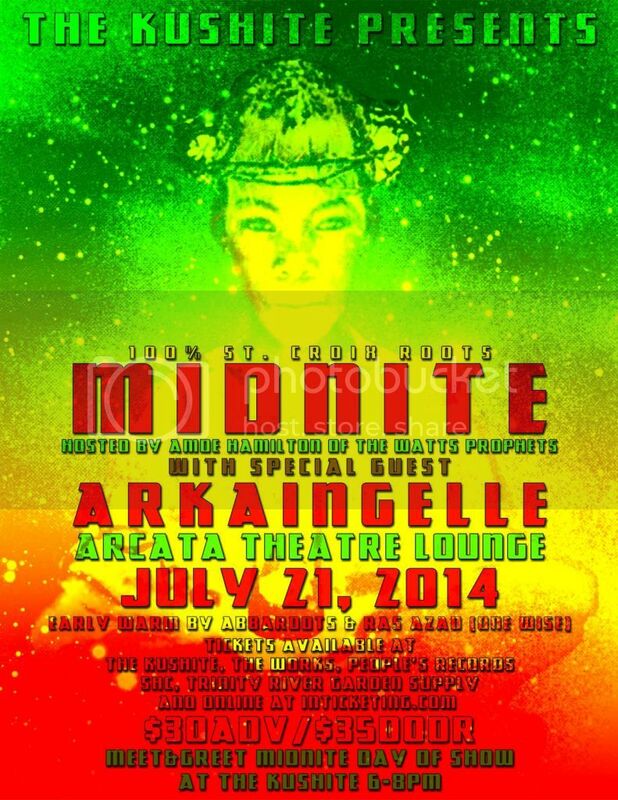 Midnite has been booked to play the Arcata Theater Lounge on Monday July 21st!! This is going to be a great show. Early warm selections from Ras Azad of OneWise Sound, hosted by Amde Hamilton of The Watts Prophets, plus special guest Ark Aingelle and State of Emergency Band to back him. PLUS there will be a special meet and greet session with Midnite at 6pm next door to the venue at The Kushite African Arts and Herbs store. Ticket will be hitting the outlets this week and will be available at The Works (eureka), The Kushite (Arcata), People's Records (Arcata), SHC (so. Hum), Trinity River Garden Center (willow creek), and online at www.inticketing.com. This one is going to be big Humboldt! Don't miss out!! Edited 1 time(s). Last edit at 07/01/2014 03:57PM by reggaestar. Thank you reggaestar! Saw the flyers at SNWMF, great addition to the tour! See you there! Getting closer to Midnite inna Cali! I am soooooo excited! Some great venues they are playing at on this tour! Anyone ever been to the Broadway in Fairfax? Heard it is a nice intimate little venue! 19 broadway is my home venue but unfortunately I'll be out of town that weekend. I will be hitting the SF show however, so am looking forward!! 19 Broadway is definitely a small and intimate venue in Fairfax, which is considered the hippie/youthful town of Marin. There will most likely be great turnout and it will be packed to the brim. They definitely let the vibes flow and it should go fairly late to 2ish I would guess. The crowd can sometimes be a little bit young but most people are generally engaged in the show, however there have been some times where the crowd is fairly young and even more party/drinking driven. Believe it or not one midnite show I was cooling out in the back and all of a sudden a fight broke out! I was shocked to see this but random behavior can happen anywhere. Have a great time there and definitely post how the show is, would love to link up for the show at the independent. Appreciate that Teachdem! Crazy to think that a fight could break out when Midnite is on stage but I to have seen it happen, I remember Vaughn crouched and stared so intensely at the folks fighting as if he was willing the fight to stop but never missed a beat on the mic. I will for sure post about the show and some of the tunes they play. We should link up for the show Tuesday night in San Fran, I will be staying with my friend in San Fran so I will be around that day. Funny that I grew up in Santa Rosa not to far from Marin County but have never been to Fairfax other than driving thru it. Whoo weee, that's some serious bus time on some winding roads. They'll need a hurl bucket handy. I'm not looking forward to all that driving but those shows will be epic!! ROLL CALL! Who will be hitting up one of these Midnite shows next week?? Sunday at Moe's. I will be there. I usually roll in late. Can't wait! Time is going by really really slow. Join us in Arcata on Monday! Bummer. I'll have some video for ya, but it is not like being there. Do you have hard tix for the shows? Would probably have to mail them here. I would be happy to try and sell your tickets or give em away for sf and Nevada city. Yeah Nomo, they are tix I bought and printed off, the money back would be nice but at this point I just want someone to be able to enjoy the show in my place. Someone who could not afford a 30 tix but loves Midnite and I could help them would sure make me feel better. I guess I would have to mail them though. Thanks Teachdem, I was close to leaving tonight and driving to Fairfax but I have to be back in Bend sunday by 2pm to work my first shift at 3pm and I would need to leave Fairfax at 5am and the show will probably end at 1-2am, would be a rough first day and 18 hours of driving for one show, so I decided to see them in Astoria and I will still be able to make ROTR which is awesome! So there are some positives ya know! Appreciate your kindness. Edited 1 time(s). Last edit at 07/19/2014 08:36PM by rossta8888. Next time bredren - shaping up to be powerful vibes in Nevada City on H.I.M. Earthday! I'm still hoping to attend the SF show but haven't got a ticket. Part of the reason is I'm living very frugally these days, having just enough to pay the bills with not much left after that. If you're still trying to unload that S.F. Midnite ticket hit me up. Bless. Midnite hitting the Arcata Theater Lounge tonight!!! Heard the Santa Cruz show was blessed last night and now the vibes continue. If you're coming from far, there are still a few tickets available online at www.inticketing.com and locally at The Kushite African Art and Herb store in Arcata. Please join us for a meet and greet session with the band at The Kushite between 6-8 tonight! Full roots vibes filling the atmosphere tonight! 100% St. Croix Roots goodness that MIDNITE brings everytime! Night full blessed! Come forward community! Great show at 19 Broadway on Saturday! Last night's Santa Cruz show was heavy, but uplifting; trance-inducing yet upbeat. Best Midnite show I've been to in years. I'm glad I went. Edited 1 time(s). Last edit at 07/22/2014 10:49PM by nomotrouble. What time you think they'll take the stage tonight ? BLESS UP Nomo for your videos. Glad to get a glimpse of the west coast shows. Hoping they make it back in the Northeast sometime this fall. Vaughn put his fisherman's hat back on. When I saw him in Boston in March he had the same or similar hat that he wore when I saw them in 2005. It was the first time I had seen him without his fisherman's hat since I had seen them at SOB's in 2005. Interesting version or different start to 'mongst I n I As well as white collar criminal. What was the tune after roll call on the 2nd video? Usually at the independent they start around 11 or so and play til 2 am. yes that was a well irie time! What a blessing Midnite is - another great series of shows!! Fairfax was good although they seemed a bit off kilter; Moes was solid, and SF had the best sound system (once the sound guy figured out what Ron and Vaughn were asking for) and a large crowd. Wish I could have seen them in Grass Valley last night, but I am thankful for the three shows in just four days! Tough to deal with work stuff day after..next time will be taking vacation around shows! Great meeting some new folks out there in midnite land. Talked briefly with a few boarders (nomo, daniel?) Thank you nomo for the videos! awesome work as usual...ROTR next?!? Yep, resting up for reggae on the river, i'm going to try and last thru all 4 days. Edited 1 time(s). Last edit at 07/24/2014 08:11PM by nomotrouble.